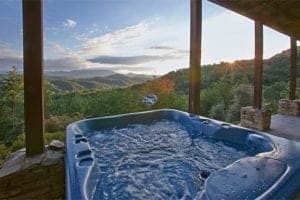 There are times when a stay at our cabins in Gatlinburg TN is needed for reasons other than family getaways. ​Rocky Top Sports World​ hosts many tournaments and special events, and your group will need a place to stay if it’s a multi-day event. We’re going to give you 4 benefits that will give your group an advantage for staying at one of our cabin rentals. Whether you’re a family, team, group, or multiple families looking to stay together, you’ll love the location of our cabins in Gatlinburg TN in relation to the event site. We have many cabins that are within 10-15 minutes of Rocky Top Sports World. But if you want to go for a gold medal location, we have a few ​cabins to reserve​ that are no more than a mile away, making it a very quick trip that will ease the pressure off your important event. If you’re a sports team looking for a competitive edge, our cabins in Gatlinburg TN offer you a way to meet with the team without knocking on doors and gathering in a small hotel room to discuss last minute game strategies. Even if you’re having a family reunion at Rocky Top Sports World, share a cabin with your family members to reminisce or hammer out some last minute plans to reduce any confusion about the details of the event. Of course, you may not want to spend all of your time at the cabin discussing strategies. Our cabins in Gatlinburg TN are great for your event at Rocky Top, because they are large enough to allow you some privacy. This can especially be true if your team suffered a heartbreaking loss in a big game. Our cabins give you a chance to decompress by giving you ample space outside and inside that’ll undoubtedly help you after a disappointing performance you weren’t expecting. Having the space to enjoy your experience with your group doesn’t mean much if you’re not comfortable. Our cabins in Gatlinburg TN give you the same amount of comfort you would anticipate in your own home. Your event has probably left you feeling exhausted, but knowing you have a cabin waiting for you with all the amenities we provide will help you recover nice and quickly. Whether it’s lounging on the couch watching a show on a wide screen TV, or breathing in the mountain air outside on the deck, comfort is king at our cabins! We’ve made it quite easy for you to decide on a stay at one of our cabins in Gatlinburg TN for your event. With cabins that offer convenience and comfort for your competition or special event, the choice becomes quite clear. ​Reserve your cabin​ now for your ticket to a terrific stay. Win or lose, you’ll succeed with our selection!